This blog is now optimized for all mobile devices! That’s right, now you can keep up with what’s going down at the Rabbit Hole no matter where you’re at. It doesn’t matter if you’re reading this on a smart phone, or a touch sensitive iDevice, you won’t have to zoom or scroll to read the latest posts anymore. Those following this blog on their Kindles will be pleased to know that the subscription feed (as well as the product info) on Amazon’s website will be getting updated soon. 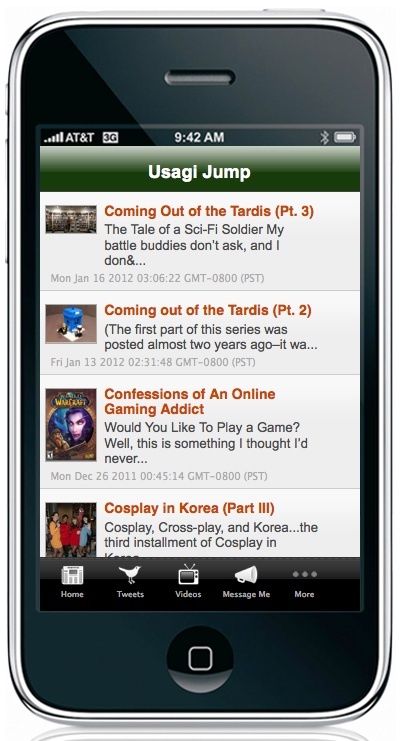 I’m excited to announce USAGI JUMP, a mobile app for Apple devices that I’ve been developing (and which will be available in the iTunes store in a few weeks). This app will collect posts from all my blogs, my social media accounts, as well as provide tools and shortcuts to all things transmedia. I’ve recently returned to the good ol’ USA, and with the time change from Korea, as well as trying to get things back to normal, posts have been a little late the last few weeks. I’m starting to adapt to the 12 hour time difference, and new posts should start appearing regularly on Sunday evenings. Check out my About Me page. For those of you who have dozens of social media accounts, websites, e-mails and related digital flotsam, this is a great way to keep everything in one place, and make it easy to share. It’s free, and for a limited time, you can even get some business cards too. 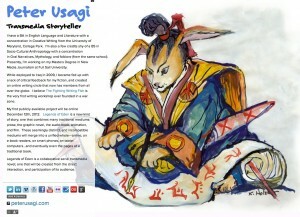 Thanks for reading, and have a great Year of the Dragon!